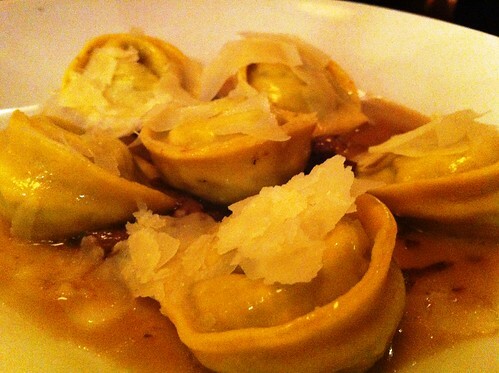 If you’re seeking hearty, comforting Italian food in DC, look no further than Elisir. 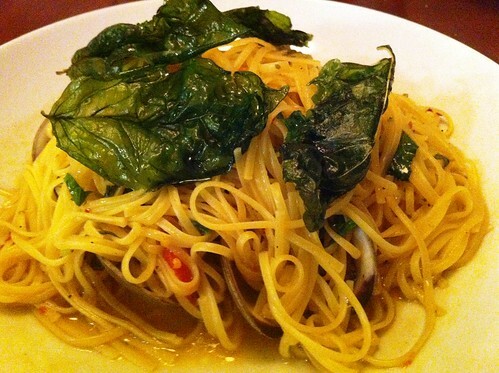 Located just off Pennsylvania Avenue NW on 11th Street, Elisir is perfect for lunch over a bowl of pasta, or grabbing a quick bite over drinks with friends after work. The portions are large and the food is great. While the decor could use some modernization and updating, the open kitchen is nice and the bar is fairly spacious. 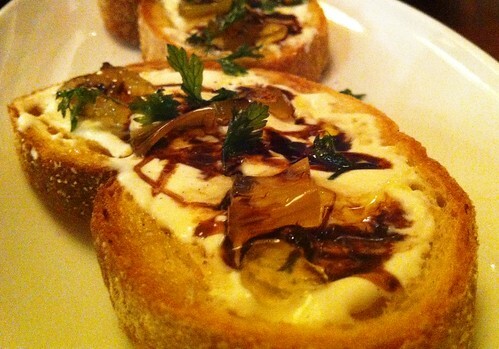 Start with the crostini with gorgonzola creamy spread, candied celery, aged balsamic. Crispy melty goodness. The tart balsamic is a nice contrast to the celery which takes on a sweet note. 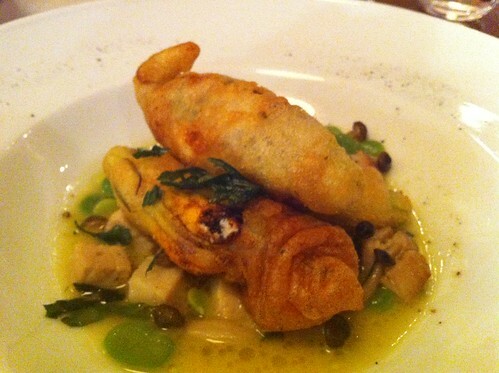 When in season, get the tempura fried zucchini blossoms stuffed with ricotta and fontina cheese, ragu’ of fava beans, chiodini mushrooms, and pork belly. While good, they were a bit heavy and unfortunately a tad soggy. I think if a bit more care was taken to the preparation of these, they would have been amazing! Plus, this is something you can do at home when the zucchini blossoms are at your local farmers market. There are two seafood appetizers that I would simply go and order as a meal when in the mood for squid/octopus. 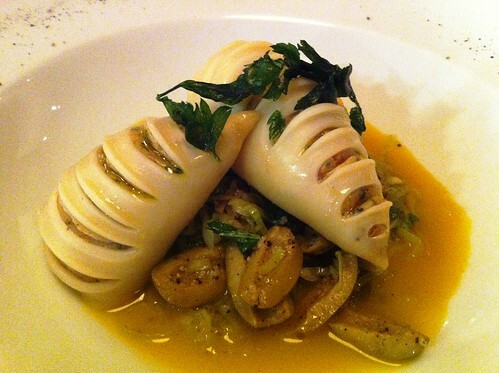 First the squid, this dish was a stuffed squid with spicy salami and shrimp, sweet garlic saffron broth, braised leeks and green olives. Yes, it is as delicious as it looks. Stuffed squid is good, but charred octopus is maybe my favorite way to eat the tentacled creature. 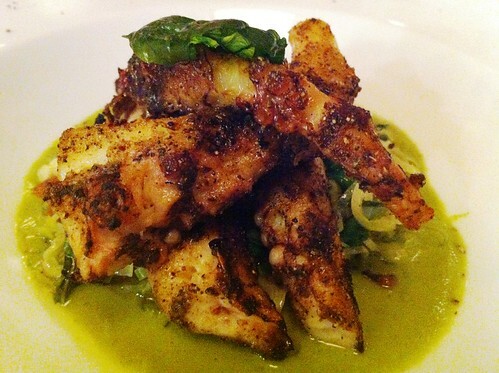 Elisir serves it grilled over broccoli puree, pancetta leeks ragu` and Limoncello vinegar. 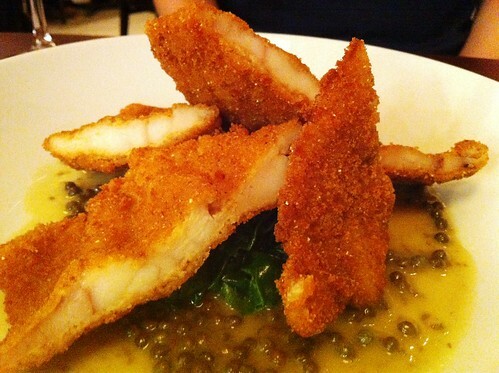 Moving on to dinner, this was a special of the evening, I believe it was panko breaded fried white fish of sorts (cod, tilapia, etc), but it was good! Hella crispy (yes that is a technical term) and moist served over lentil and braised greens. For the meat lovers, the seared Italian sausage special is delicious. 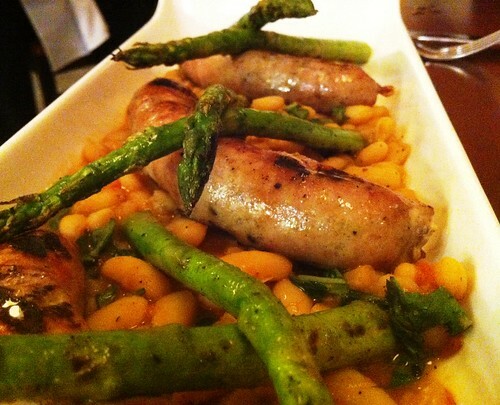 Grilled spicy sausages served over canaloni beans with grilled asparagus. Simple, hearty, and filling. But this is Italian, so don’t forget the pasta. One of my all time favorite dishes is linguine with clams. Their version comes Neapolitan style, with little neck clams, basil, spicy pepper, touch of San Marzano. While my Italian Grandmother’s is still the best, this certainly is the best I’ve ever had at a restaurant. Well done! Last, go with the homemade spinach tortelloni with an eggplant parmigiana and burrata filling, in a creamy Mascarpone sauce.